** BBI BINARY TM HYDRAULIC MANIFOLD SYSTEM for MagnaSpread 3: Combines the hydraulic controls for the conveyor and spinners into one control manifold. 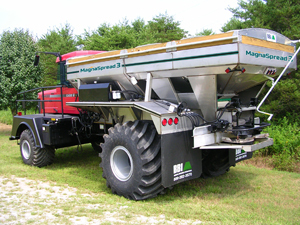 It includes proportional manual speed control for both spinners and conveyor. Pilot operated relief is standard. A dump valve and a GR is standard for the conveyor. The modularity of the BBI Binary Manifold allows for quick easy conversion to electronic control.